Download ID Card Designer for Mac design and print multiple ID cards with option to add text, barcode, signature and photo. Software design and print multiple ID cards with advanced print settings. 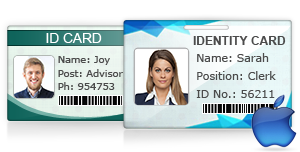 You can save designed ID cards in various file formats including jpg, jpeg, png and other major file formats.